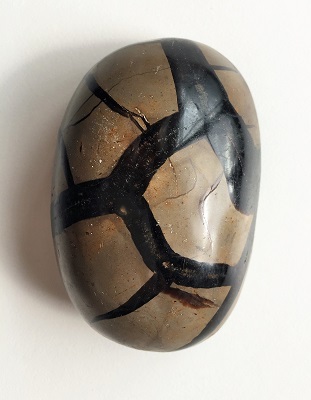 Giraffe skin patterned Septarian Polished geode from Africa. 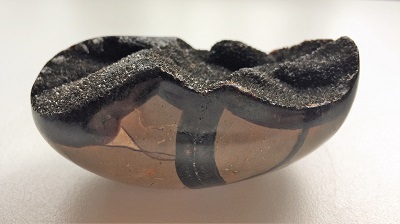 Beautiful black and brown giraffe skin patterned Septarian Polished geode filled with sparkly druzy black calcite from Madagascar, Africa. 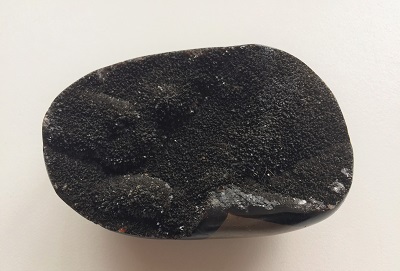 Also known as Septerian, Septaria, and comes from the Latin word Septem or Seven because the mud ball from which it is formed on the seabed splits into seven points radiating in every direction, a sedimentary fossil stone that forms as colony of micro-organisms, similar to polyops coral. 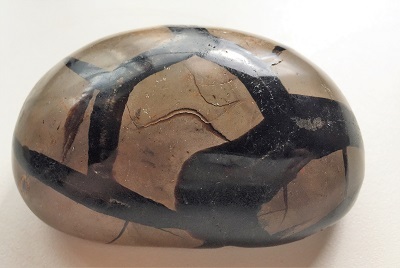 Septerye is a combination of Calcite, Chalcedony and Aragonite. Calcite facilitates the opening of psychic abilities, channeling and out of body experience, calms the mind and teaches discernment. Chalcedony provides the pathway to receiving thought transmissions, telepathy and useful for balancing the energy of the body, mind, emotions and spirits. Aragonite is attuned to the Earth Goddess, transforms geopathic stress and clears blocked ley lines even at a distance. It is a grounding stone and a reliable Earth healer that restores balance for meditation by raising vibrations to a high spiritual level.